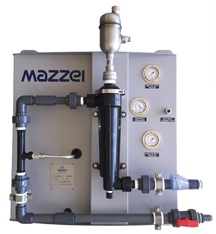 Mazzei injection systems are designed using the company’s patented technologies to obtain the most efficient mixing and contacting of air, oxygen, ozone or chemicals into a water stream. 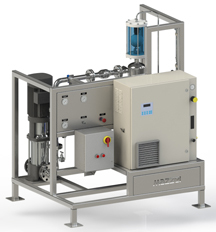 These skids can be used for municipal wastewater aeration or oxygenation applications—eliminating the need for basins—for municipal drinking water pre-filter oxidation and most industrial or municipal chemical injection applications. 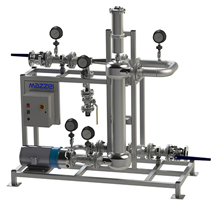 Whatever the application, Mazzei skids provide exceptional performance with low horsepower requirements and within a small footprint. 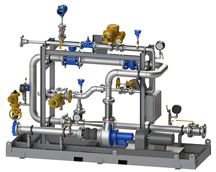 Aeration or air stripping skids are designed for municipal and industrial drinking water inline applications and are efficient at volatile organic components (VOC) air stripping. They remove methane, hydrogen sulfide, CO2 and other VOCs from the water stream by injecting air into it. 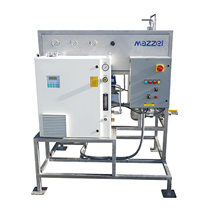 Contact a Sales Engineer to find out more.